Wine Country: Impressions in Oil is one of my favourite artbooks of 2018, and it's also one of the best I've seen this year. Erin Hanson has been painting since she was a kid, and started commissioning paintings at age ten, went on to attain a degree in Bioengineering, and entered the art industry and has been producing one painting each week ever since. Her story is one of talent, dedication and work rate. 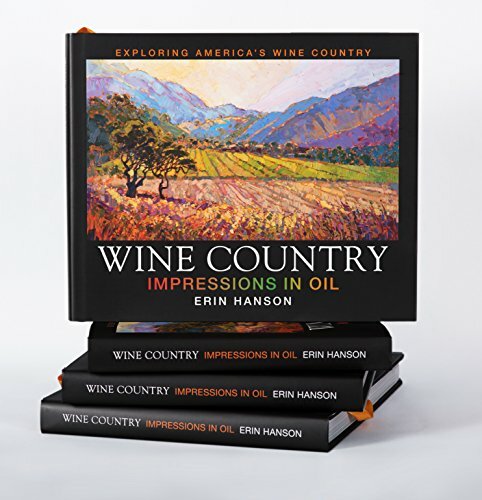 Wine Country is Erin Hanson's latest book. Her earlier books are Open Impressionism: Vol 1 (2014), Open Impressionism: Vol 2 (2016) and California Wine Country (2014). Wine Country is a new edition of California Wine Country and includes 100 more pages of artworks to include paintings created in the last four years. Erin Hanson's oil paintings are absolutely beautiful, breathtaking. It's easy to run out of adjectives when describing her work. I peruse each page of this 314-page hardcover with delight. She paints in a style she calls Open Impressionism. It's a mix of Impressionism but in her case, she uses vibrant colours and varied short strokes. It's a variation of Impressionism, and to me, it's an exciting variation because of the way she uses colours. This artbook does a good job with reproducing her paintings, many of which were sold to private collection. The paintings are reproduced huge and a pleasure to look at. The originals are even larger. Other than standing in front of her actual paintings, I guess having this artbook is the next best thing. I find myself lingering on each page longer than I normally would, mesmerised by the art. Wine Country: Impressions in Oil is available at Amazon US and through Erin Hanson's website. It's priced at US $95. Pricey, yes, but absolutely worth the money. The quality is obvious. This book was provided by Erin Hanson and her gallery for review purposes.